A powerful sight in Grafton that many people had to stop and see for themselves. The Milwaukee River flowing at higher-than-normal levels, even overflowing in some areas and covering the sidewalk. "It’s just amazing," said John Hahm, who has lived in Grafton for about four years. "You just see the force of nature at work." Hahm also says he works at a local hardware store and recent storms have sent a lot of people looking for equipment to save their flooded basements. 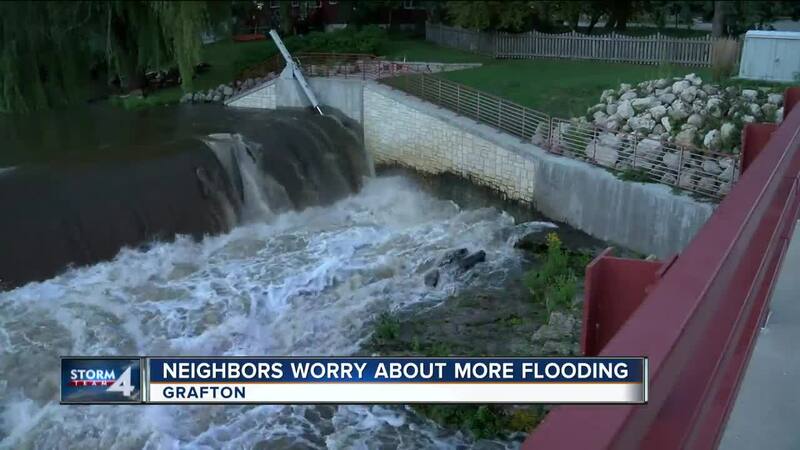 "They want carpet driers, sump pump equipment, anything to pump out the water," he said. Highway crews also pumping out water along I-43, where flooding caused a nearly three-hour shutdown on the northbound side just south of the Grafton exit. "We couldn’t get through our normal bridge, it’s all covered by the Milwaukee River," said Steve Weddig, who lives near the river in West Bend. "Living here and seeing what it was a week ago, it’s just stunning and more to come."